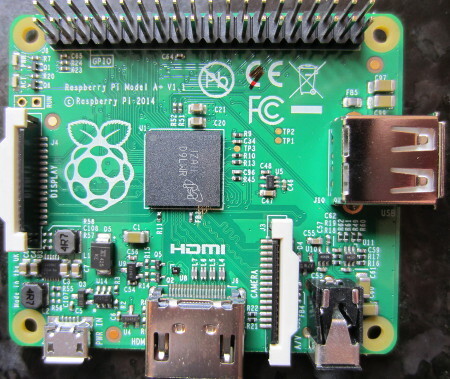 Pictured below is the latest Raspberry Pi – the Raspberry Pi Model A+ which replaces the old Model A. 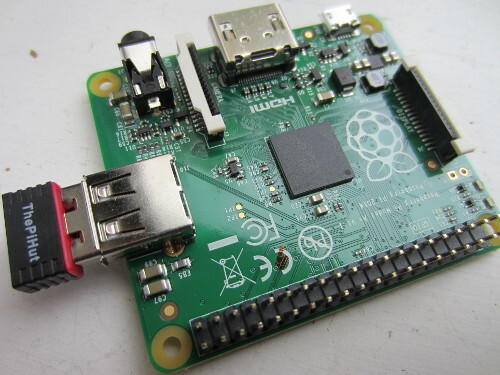 As with the Raspberry Pi Model B+ released back in July 2014 (see here: New Raspberry Pi Model B+), the Model A+ has the 40 GPIO pins, reduced power consumption, modified composite video, and a micro SD slot, but the Model A+ still only have 256MB of RAM compared to 512MB for the B+. The Raspberry Pi Model A+ is smaller than all previous credit card sized Raspberry Pi’s being a whole 2cm shorter in length. With just the one USB port and no ethernet port, if the Model A+ is to be accessible over your network, you will need a USB WiFi adapter as pictured below installed in the A+. It is likely that the Model A+ will primarily be used as a headless device, but initial set up of Wi-Fi still requires a keyboard and display to be connected – a USB hub is useful at this time. With everything configured, the Model A+ is ready for embedding in your projects. The following is a very useful guide from How-To Geek which shows how to set up Wi-Fi from the command line: How to Setup Wi-FI on Your Raspberry Pi from the Command Line.